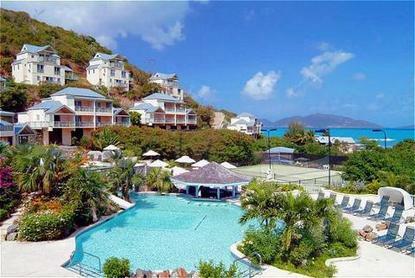 Long Bay Beach Resort and Villas epitomizes the tropical informality and natural beauty of the British Virgin Islands. Hidden away on a 52 acre estate in Tortola this 157 room resort rises up the hillside from the islands finest beach a mile of talcum powder sand caressed by the gentle surf of the Caribbean Sea.Reflections of the islands colonial history are evident throughout the rambling main building suggestive of a plantation house the beach restaurant set in an 18th century sugar mill and many of the private villas evoking traditional island homes.Yet leisure facilities fulfill all the requirements of a contemporary tropical resort and include a swimming pool tennis courts fitness room and scuba diving facilities as well as a Wellness Spa and Salon. Equally varied are the dining opportunities the venues ranging from hillside poolside or beachfront and the cuisine varying from informal grills and fresh seafood to Continental specialties and traditional Italian favorites.A wide variety of accommodation styles also await here all guest rooms boasting memorable views of the Caribbean Sea. Stay right down on the beach in a spacious room or quaint cabana. Or choose one of the hillside rooms or villas all of which boast their own private balconies and some of which feature private Jacuzzis full kitchen facilities and alfresco dining terraces. There are even a handful of private Estate Homes complete with private swimming pools and up to four bedrooms.